The “Carpenter’s Star” is a favorite pattern for men. 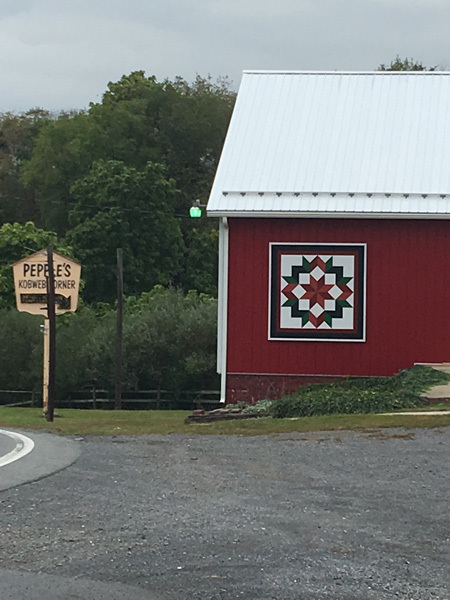 Craig Paylor, a local successful businessman, chose this pattern for the former Pepple’s Auction Barn which he now owns. This design was only attempted by the most skillful quilter because of the many angles. Just as a carpenter needs to be precise, so does the quilter for this quilt pattern to lay flat. Also, during the mid to late 1800’s the Carpenter’s Star was also often times called the Wagon Wheel design. Hence, legend has it this pattern was used as part of the Underground Railroad. Secret messages in the form of quilt patterns aided slaves escaping the bonds of captivity in the Southern states before and during the American Civil War. Slaves could not read or write; it was illegal to teach a slave to do so. Codes, therefore, were part and parcel of the slaves’ existence and their route to freedom, which eventually became known as the Underground Railroad. According to legend this quilt pattern was a signal to the slave to pack the items needed to travel by wagon or that could be used while travelling. It could also mean to pack the provisions necessary for survival, as if packing a wagon for a long journey, or to actually load the wagon in preparation for escape. Some records indicate this symbol meant a wagon with hidden compartments in which slaves could conceal themselves, whom would soon be embarking for the trip to freedom.